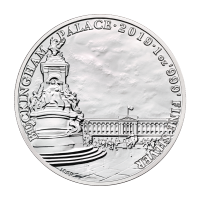 Monumentos de Gran Bretaña | Moneda de plata Palacio de Buckingham 2019 de 1 oz Enjoy the web’s lowest rates, when you purchase your 1 oz 2019 Landmarks of Britain Buckingham Palace silver coin from our online shop today! This stunner is the 4th and final installment in the Royal Mint’s acclaimed Landmarks of Britain series. The subject and feature of this edition’s reverse is surely one of Britain’s most iconic landmarks, Buckingham palace, beautifully depicted in the field, while the Queen Victoria Memorial fountain takes the fore. Also on the reverse, the Buckingham Palace title, the year of issue and all necessary details of weight, metal content and purity. The obverse imagery is none other than Elizabeth II, shown here wearing her lovely State Diadem…she is set against a light refracting field of micro-engraved, dot texturing. Also on the obverse, Elizabeth II’s regal title, along with he coin’s unique denominational value. Buckingham palace, home of Britain’s beloved monarchy, boasts a grand total of 775 rooms and is located in the heart of bustling London. Celebrate Britain’s rich heritage and diversify your portfolio with a 1 oz 2019 Landmarks of Britain Buckingham Palace silver coin today.